Varied Hair Scissors Commonly Utilized In Salon – At this time, more and more people are starting to care about their appearance. We can say that many people who do not hesitate to spend their money just to improve or maintain the look to be more attractive than ever. For that reason, it's no wonder that there are increasing number of beauty salons and beauty clinics that you can find especially in the city. Unsurprisingly, the request of professional hair stylists or hairdresser to be employed in salon is also very high. Considering the prospective career in beauty salon, many people are also eager to become professional hairdressers. Are you one of those who want to be a professional hairdresser? If yes, it would be nice if you know in advance the types of hair scissors that you will use. The following is an explanation of the types of hair scissors that are usually available in salon along with their uses. Standard scissor is one of the most frequent scissor that you will find when you are in salon. As the name implies, this standard scissors are designed as the same standard model as scissors in general. Then what's the differences between hair scissors with other type types of scissors? The difference is, hair scissors are designed specifically to cater the needs salon customer. You can see especially on the eyes of scissors which are made very sharp. With this scissor’s eye, the scissor will cut the hair perfectly and not fold or bend the hair. Hair scissor is also made more straight than other scissors. In terms of price, hair scissor is also more expensive than other types of scissors. Because hair scissors are made of higher quality metal than other regular scissors. Therefore, you are advised to cut the hair with a special hair scissor so that the hair is not damaged or branched. Standard scissor itself has a different length and design. The scissor that is used should be comfortable enough if held. Because in addition to working to cut hair, the scissor also serves as a tool to make your hands longer in range. 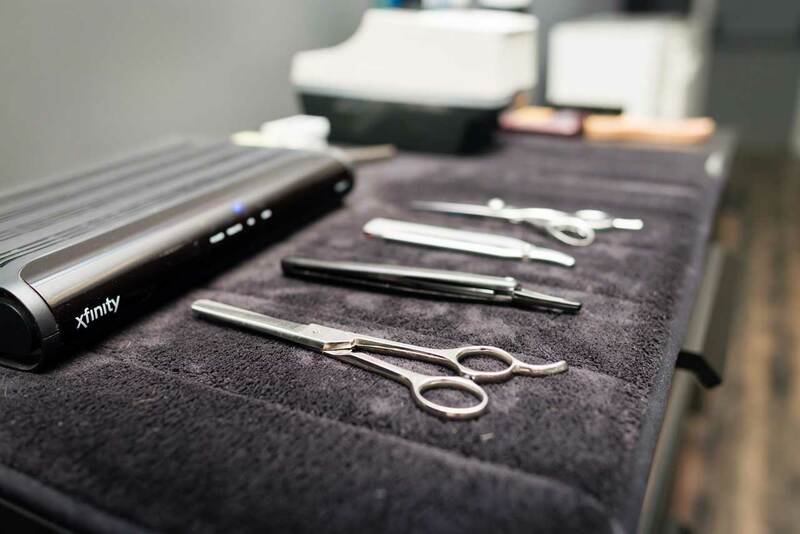 By using standard scissor as well, a professional hairdresser will be able to produce a variety of hairstyle such as blunt cutting, sliding, and make hair texture. In addition to the standard scissor, other scissors often used by hair stylist is, thinning scissors. As the name suggests, thinning scissor has a function to thin the thick hair without having to reduce the length of the hair itself. Thinning scissor can be used only on dry hair (not wet). If you want to increase the volume of your hair or make hair appreance to be more shaggy, usually the hairdresser will use thinning scissor. In fact, sometimes, thinning scissor create the same results as the razor provides, only more neatly. About its shape, it has the same shape as any other scissors. It's just different on the scissor’s eyes. Standard scissor’s eyes is perfectly straight and sharp line design, meanwhile thinning scissors have two different design types of the scissor’s eye. They are thinning scissor with 2 jagged blades (like a comb) and thinning scissor that has one jagged blade on one side and one common knife blade on the other. Clipper may be more often encountered when you go to the barbershop. Widely known by many people, clipper is commonly used to cut the short hair or the very short hair like hairstyles of the military men. Clipper is also good for blunt cutting. To produce a more pointed haircut and create a variety of thin and small lines making men's appearance more attractive, the hairdresser usually use smaller clipper to produce the desired result. However, to create a line shape on the head line, you can use a clipper with a regular size. Do not forget to make sure to close the razor with lever, in order to make the cut shorter. In addition, the clipper also has complementary tools with different sizes. Complementary clipper is usually used to create a variety of styles such as, scooping out in the area of hair roots to thining the hair. The use of clipper is actually safer than scissor, because the razor is parallel to the skin so it can not hurt the scalp. The last type of hair scissor you should know is a razor. To cut the hair using a razor, the hair should be wet during cutting. That way, the razor can cut or slice the hair properly. Before using the razor, it helps if you to check the sharpness of the blade first. Before using razor, make sure that the blade is sharp, or else it will make the hair become branched and damaged. Currently, you no longer need to be afraid to buy disposable razors. Currently, the razor has been specially designed, so that you can replace the knives repeatedly, especially if used to shave the remnants of the hair from the baseline. What Are The Differences of Beauty Salon and Beauty Clinic? Hello, BeauteSalonSpa.com contains usefull information about beauty salon/spa marketing insights complete with hair, nail, skin and makeup tips. Learn More?